Christian Friedland was a computer science grad student working at a local plumbing distributor when he noticed that people often had a hard time finding the home improvement products they needed. Working out of his apartment, Christian developed the first version of the site that would become Build.com, now one of the fast-growing online home improvement retailers and #79 on the IR 500 list in 2014. Known for its huge selection and unmatched customer service, the company still focuses on its original mission of smarter home improvement - and a big part of that is making it easy to shop on Build.com. We've had specific, unsolicited comments from customers about how happy they are that we offer Amazon Pay. 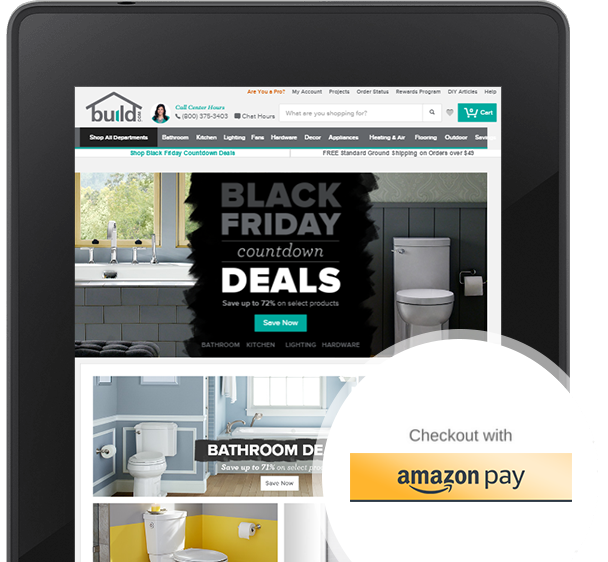 Almost immediately, customers began to adopt Amazon Pay on Build.com. We’re delighted to be offering our customers an easy and convenient way to pay. Amazon Pay lets millions of Amazon customers pay using the shipping and payment information already stored in their Amazon account. Customers complete their purchase entirely on Build.com rather than being redirected to a third party site. Josh calls this “a huge win,” both because of the seamless customer experience and the analytics transparency.